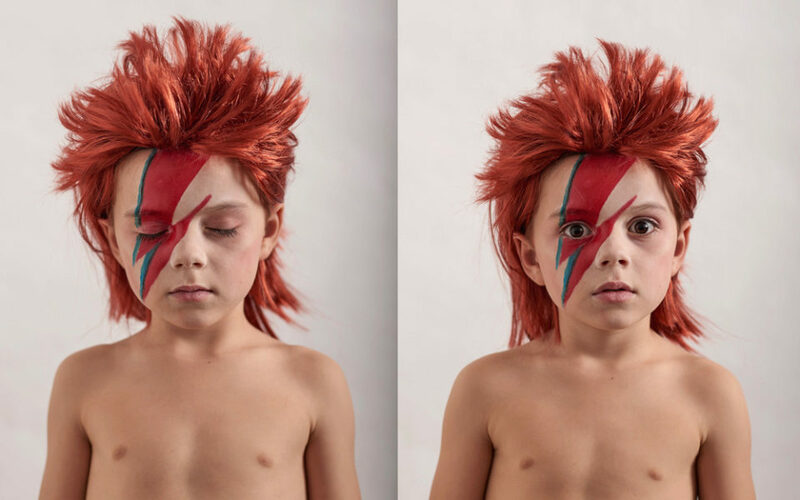 For halloween inspiration this year, look no further than the events of 2016, it has been a shocker of a year. We’ve lost some heroes, lost our place in Europe …and lost our minds playing Pokemon Go. 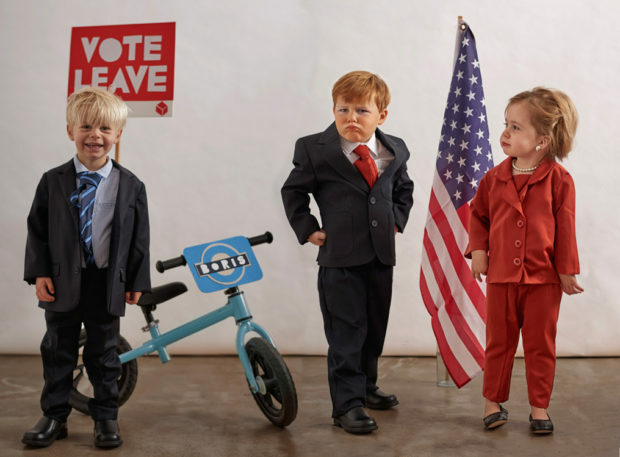 Here are some little guys dressed as the scariest, silliest and cutest events of 2016 for your trick or treating pleasure. Perhaps the scariest of all are yet to come as Trump and Hillary battle it out on November 8th. 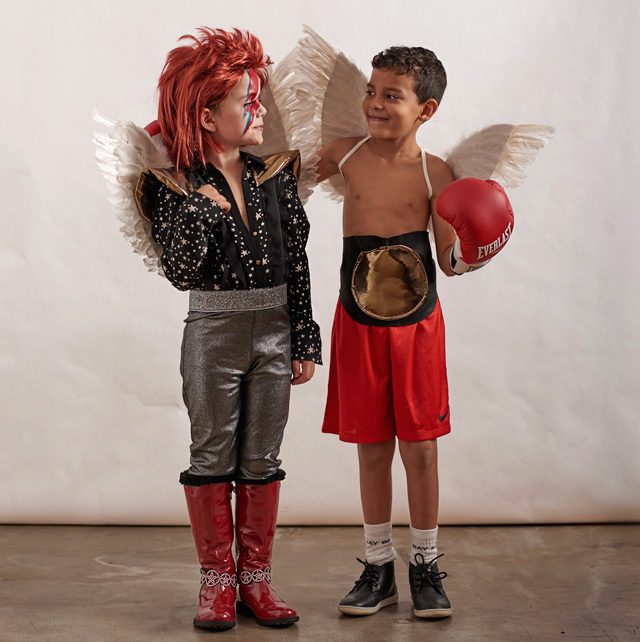 See our step by step instructions with where to buy and how to make all of these costumes. Strike fear into your liberal neighbours! Terrify your middle-class friends! This villain leaves a trail of destruction in his wake, making promises he can’t fulfil then slinking off to leave someone else to deal with the mess. Mwa ha ha ha haaa! 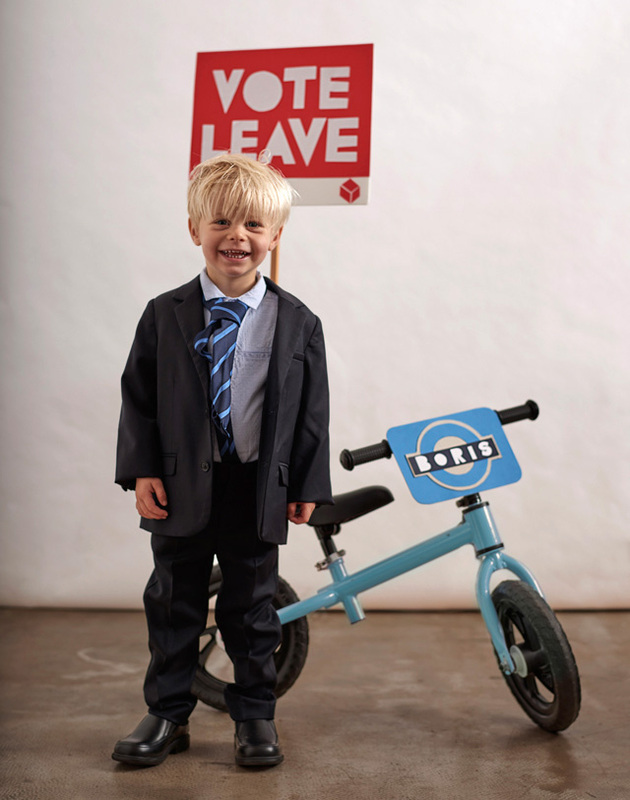 Boris (Lyndon) wears: Suit and shirt from Zara Kids, tie from John Lewis, shoes from M&S, bike and placard model’s own. 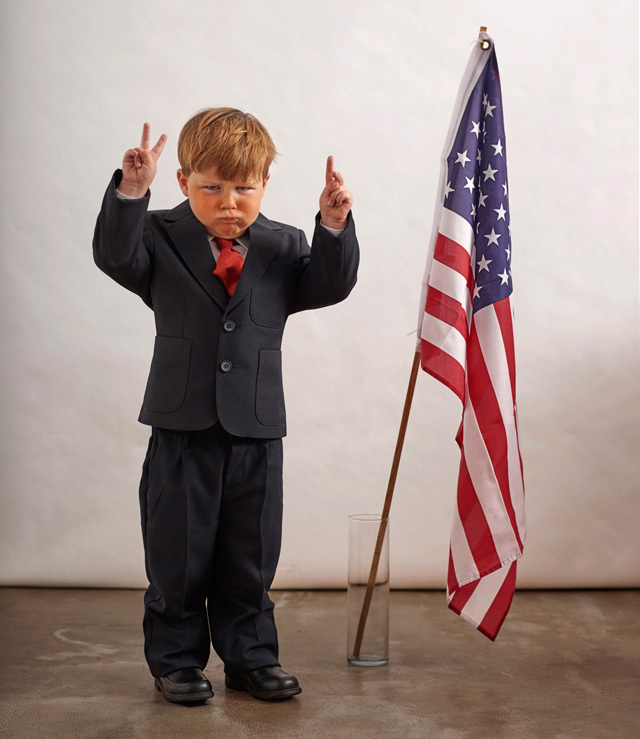 (Actually his dad will kill me for saying that… I made the placard and promptly destroyed it after the shoot.). See our step by step instructions to make your own here. In a display of massively overestimating the maturity of the general public, the Natural Environment Research Council (NERC) opened up suggestions to name their new ship, and we all got behind Boaty McBoatface! The moral to this story (and perhaps the story above as well), don’t ask the general public for their opinions unless you want a really silly answer. 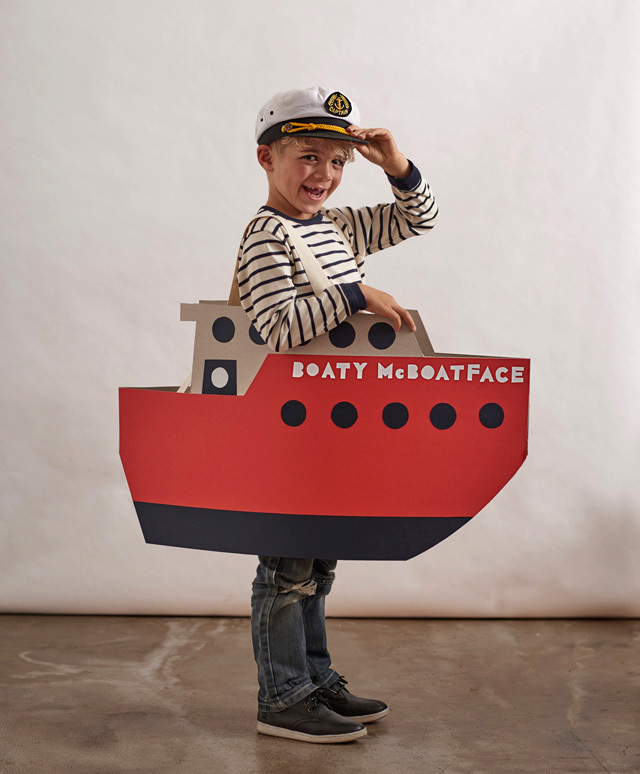 Boaty (Horace) wears: Top by Petit Bateau, jeans, shoes and hat model’s own and a homemade cardboard boat costume. Make it! Behold, the most terrifying of them all. The class clown, the ultimate douchebag, the original American ego …and alongside him, the woman who looks like she honestly can’t tell anymore if she’s living in reality or a Saturday Night Live sketch. Trump (Bertie) wears: Shoes from M&S, Suit and tie from John Lewis and Rimmel bronzer. 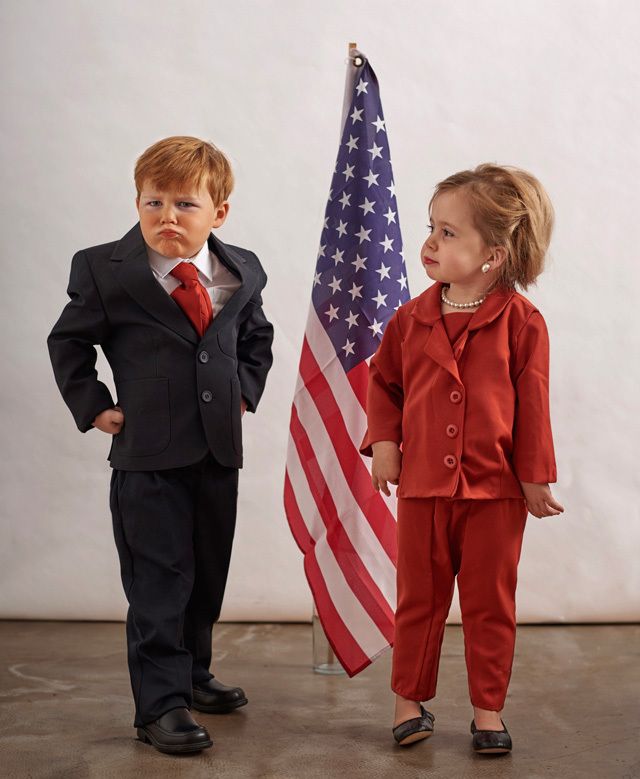 Hillary (Frida) wears: A custom-made pantsuit fashioned from a ladies’ Next dress, shoes from Zara Kids, accessories from M&S. The year started off with some sad news that David Bowie had left us to play a fantastic gig in the sky, shortly followed by Prince. 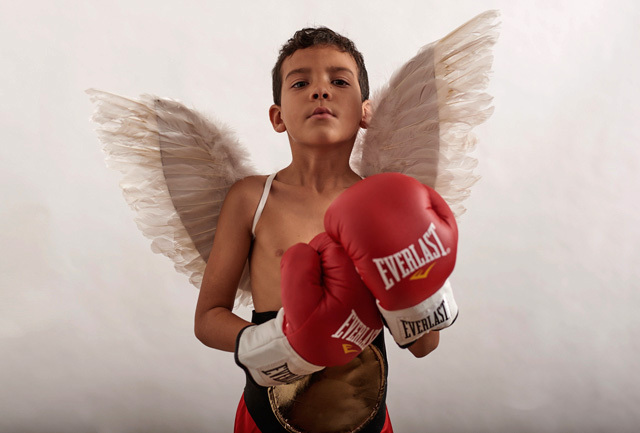 We hope they are rocking their angel wings at the best dressed jam session in heaven. 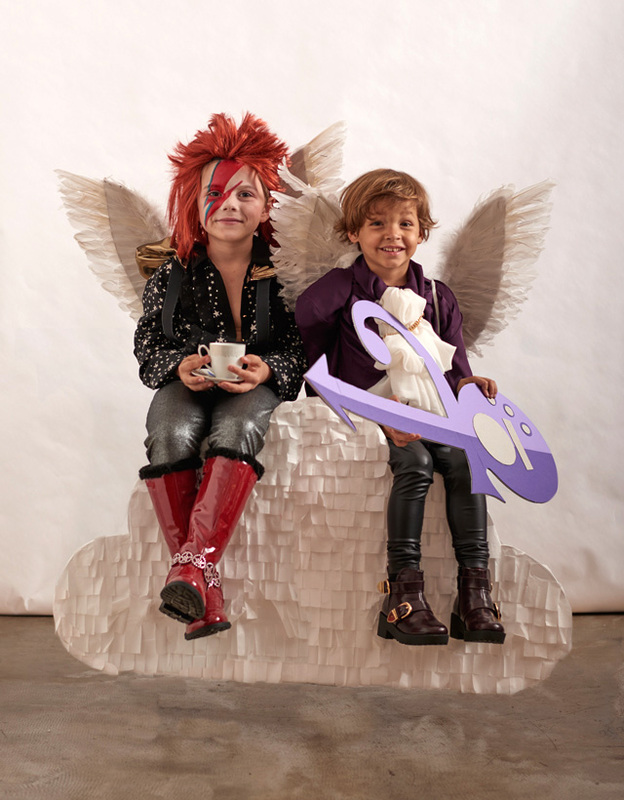 Elliot (Bowie) wears: Shirt and leggings by River Island, shoes by Lelly Kelly, Bowie wig from I Love Fancy Dress, angel wings from Claire’s and handmade shoulder pads. Make it! 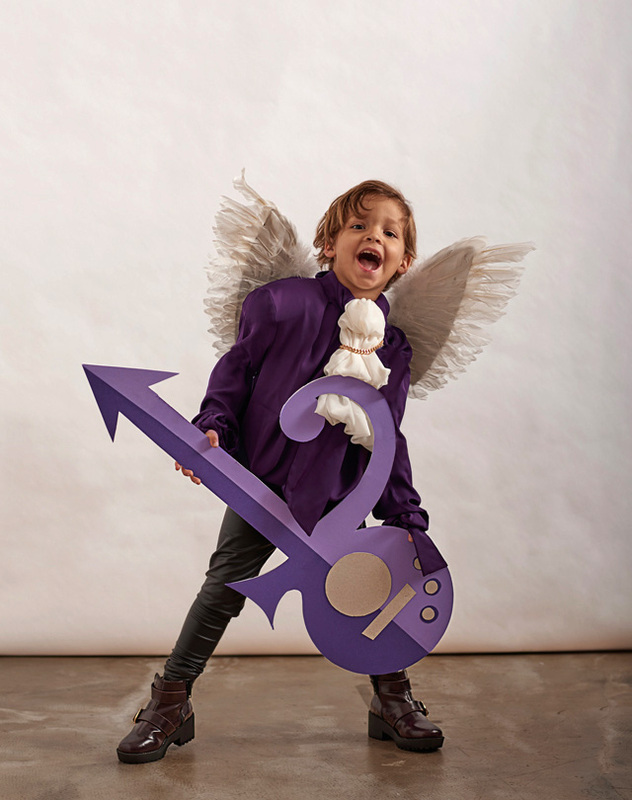 Art (Prince) wears: Shirt from H&M, leggings from Zara Kids, shoes from River Island, angel wings and necklace from Claire’s Accessories and a handmade guitar. Make it! In June Muhammad Ali joined Bowie and Prince at the big gig in the sky. 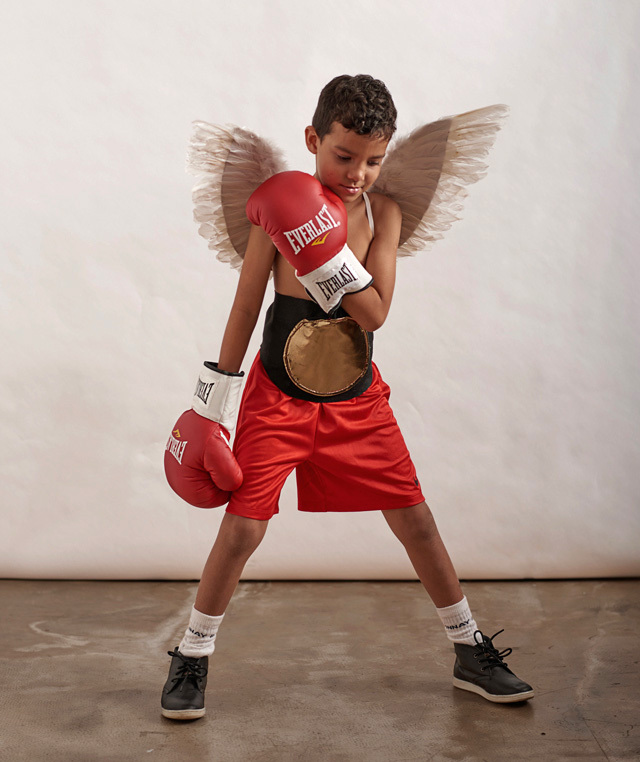 Muhammad Ali (Ryan) wears: Shorts and socks from Sports Direct, Everlast boxing gloves from Argos, angel wings from Claire’s Accessories, model’s own shoes and a handmade champion’s belt. Make it! When you hear an announcement at the train station warning Pokemon catchers not to fall onto the tracks while collecting imaginary cartoon creatures, you get the feeling that the world has gone mad. Then when you see half the people on the platform take out their phones… you know for sure. End of days. 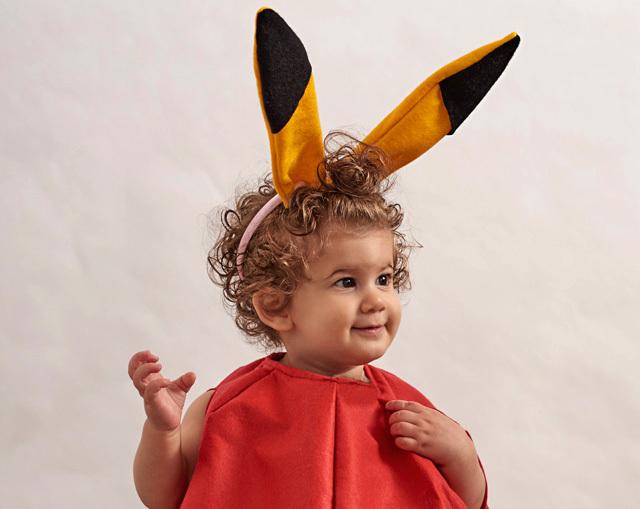 Pikachu (Agnes) wears: A handmade ball costume and headband. 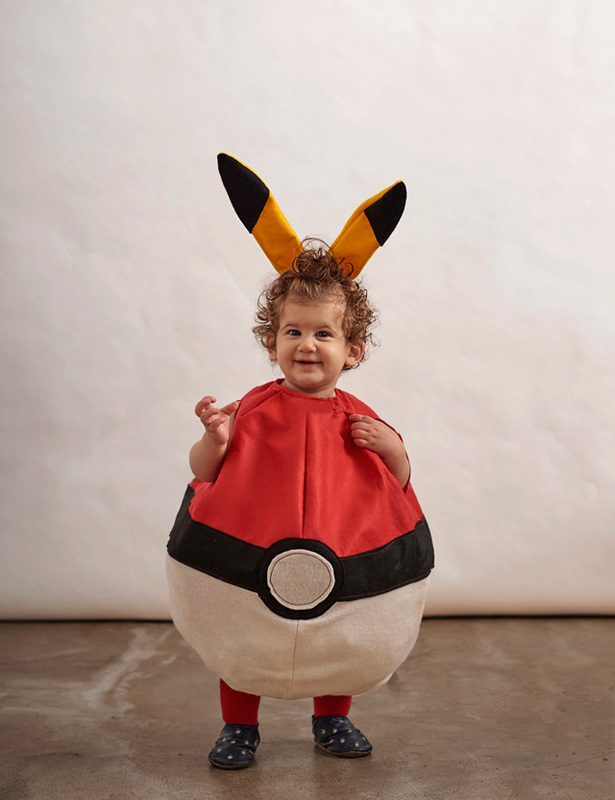 Unbearable cuteness, model’s own. See our step by step instructions to make your own here. Thank you to all of our fantastic little models and their parents for letting me dress them up a terrible, terrible politicians. 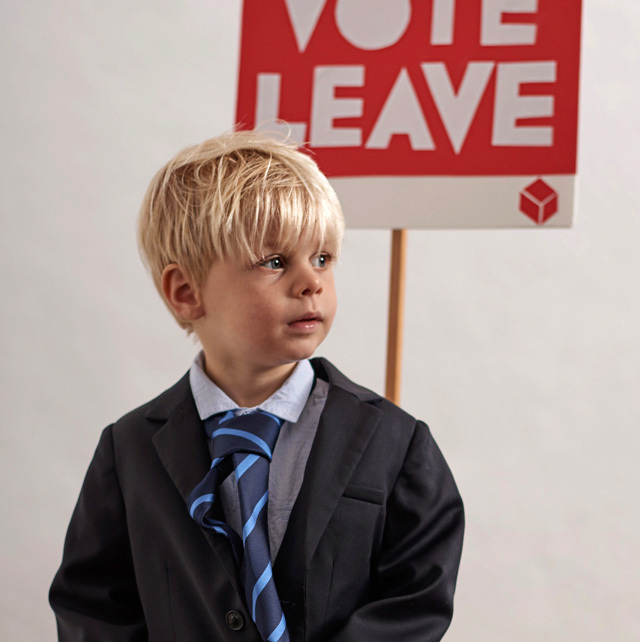 Especially Bertie, who took on the role of Trump so well despite actually being a really lovely boy! Thank you to Lyndon, Ryan, Horace, Elliot, Frida, Bertie, Agnes, Art, Zoe, Ben, Clemmie, other Ben, Lotte, Celia, Keith, Rawl, Polly, Sophie, Margherita, Tom and Dee. LIKE THIS? For more Halloween ideas, check out my previous Halloween shoots, The Terrors of London, The Tattooed Lady, and The 10 Minute DIY Skeleton Costume.